A Maryland couple has decided to sue for $2 million when they discovered their new home was invested with snakes. "Once we found three and the size of them, of course your emotions are going crazy,” Jody Brooks, the matriarch of the four-person family who moved into the home told WUSA. “We've kind of settled our fears by talking to the experts but my first quest was, help me emotionally, just tell me that this snake would never have mistaken our four-month-old baby for a vermin and curled up in the crib with her." Jody, her husband Jeff, and their two children – aged four and 9 months – moved into the home in January of this year but just recently discovered their slithery housemates. And now they are suing their Realtor for $2 million. The suit, thankfully, does not name the couple’s mortgage originator. 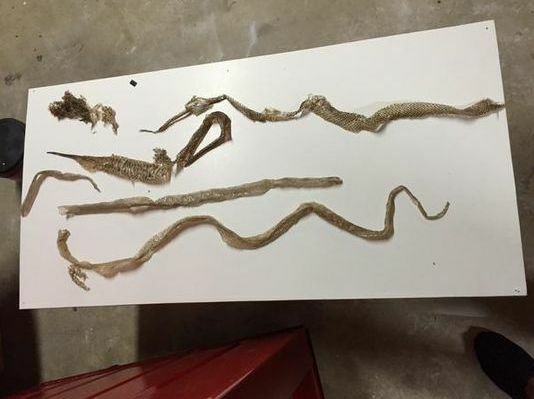 On April 11, Jeff Brooks noticed a seven foot snake in the basement and called Home Paramount, which killed the snake before leaving. An hour later, Brooks discovered a four-footer in the basement as well.